March 7, 2019 / Modified mar 7, 2019 3:35 p.m.
Three proposed routes for the "Sonoran Corridor" freeway project shown in an Arizona Department of Transportation map published in connection with a March 7, 2019 meeting and public comment period lasting through April 7. The Tucson area's newest freeway, nicknamed the Sonoran Corridor, is years away from reality. But state officials want to give residents a chance to comment on exactly where it might end up. The Arizona Department of Transportation has narrowed down the possible routes for the Sonoran Corridor to three, from 10 listed last fall. ADOT spokesman Tom Herrmann says it's important to find out how people feel about the different routes. "We want to know that by the time we're ready to turn that first shovel of dirt that everybody's had a chance to comment we've heard and wait all their opinions and come up with the best possible method we can, because we know those folks will be living with that freeway," Herrmann said. 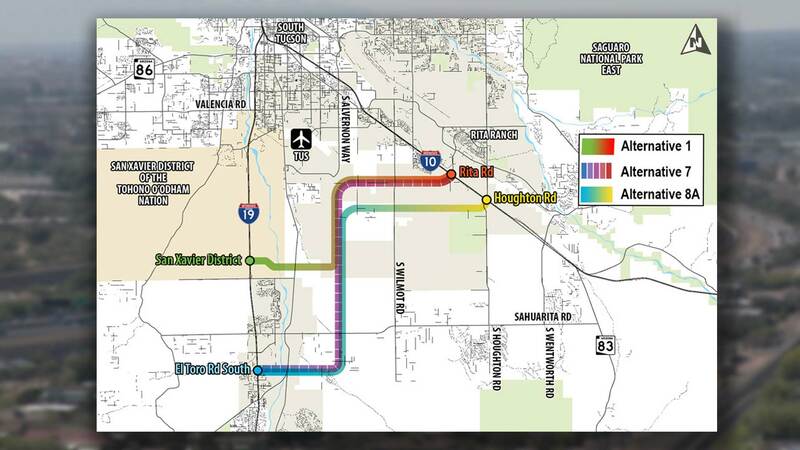 A map on the ADOT website shows the new freeway would connect an existing I-19 interchange, either at the San Xavier District or El Toro Road, to an I-10 interchange, either the one at Rita Road or Houghton. The project is designed to give border traffic a way to avoid adding to the traffic burden in metro Tucson. The public meeting is scheduled for Thursday, March. 7, from 5:30 – 7:30 p.m. at the DoubleTree Suites by Hilton Tucson Airport, 7051 South Tucson Boulevard. ADOT officials will give their presentation at 6 p.m.